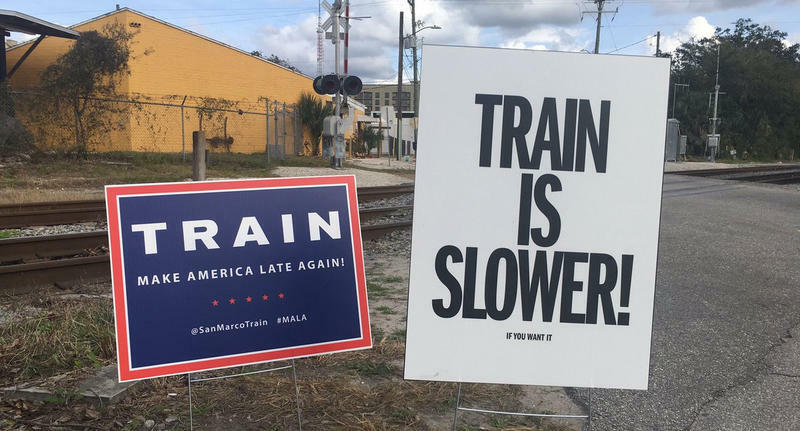 The San Marco Train's slogan is "Make America Late Again." Jack DeYoung, the Digital Director at Nuera Marketing in Jacksonville, admitted Thursday on Twitter that he was the voice behind the mock movement to "Make America Late Again" as he announced the train was being retired. But not before one final jab. WJCT workers arrived at the station this morning to find the "Make America Late Again" sign in front of the building. The train also aimed a final tweet at WJCT (see the tweets at the bottom of this story). 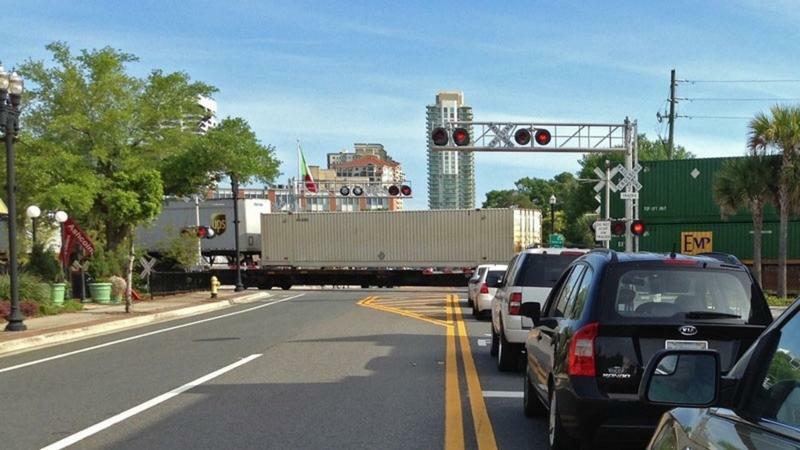 DeYoung took aim at a variety of topics and personalities around Jacksonville under the guise of being the San Marco Train, which as every commuter that travels Hendricks Ave. in San Marco knows, can cause maddening delays. The San Marco Train took particular notice of WJCT's Melissa Ross. The two exchanged heated but friendly digs at one another over the past month or so. But it was all in good fun and in the end he helped with the fundraising for WJCT's final pledge drive of the year. As to why DeYoung finally decided to reveal himself and blow the train's final whistle, here's his tweet along with a few others from the San Marco Train. And, if you'd like to hear from the "train" himself, tune into First Coast Connect Friday at 9 a.m. on 89.9 WJCT-FM. DeYoung will be among Melissa's guests. This started as a way to make my coworkers and my wife laugh. I got a little too into it (see the multiple gibberish notes written on my phone at 4am) but it was a lot of fun. This was nice to see after we singlehandedly saved @WJCTJax from certain doom with our generous donation. Nice try, Mr. Bicycle Man. This is penance for that freaky fast Jimmy John's cyclist (who was obviously doping) that jumped the San Marco Train. We know the original is considered a classic but we made some edits that make this film even better! Hi! We're the Ghost of San Marco's Christmas Future! Pledge undying loyalty to San Marco Train or embrace this NEW REALITY on your daily commute. You: "Oh no, the train! Hopefully it's a short one..."
So @MelissainJax decided to #FirstCoastNEGLECT the part of the deal where she admitted defeat and we still donated a cool five hundred bucks. We don't ask for much, @MelissainJax. Just that you admit what everyone already knows...that we've bested you at every turn and you endorse our #MALA mission. That said, we're an honorable train and will make the $500 donation to @WJCTJax. Need the tax break. In which local NPR host resorts to schoolyard insult hashtags to get the #SanMarcoTrain bump. Local media is calling the theft of our Make America Late Again signs "the crime of the century."